Nice job David H, would love to pack Rannoch Moor one day. 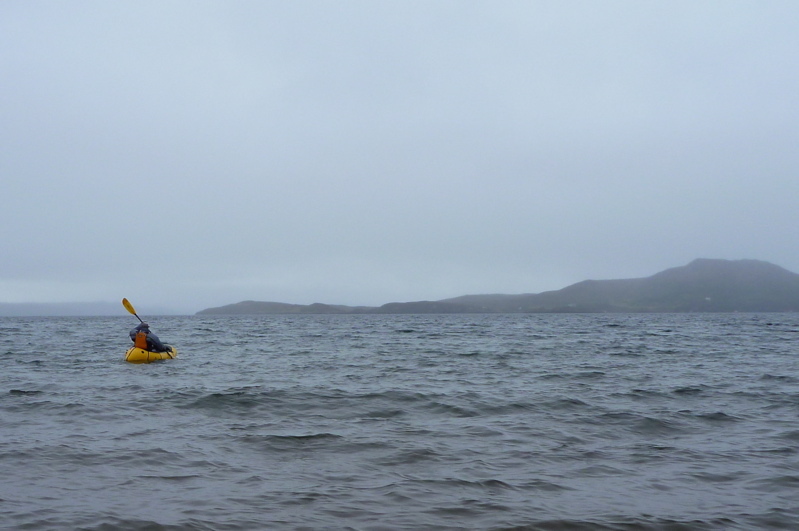 Here's my recent contribution to packrafting in Scotland - first proper trip in my new Yak. What a great way they are of exploring up here. Great trip Chris and awesome pics! I think you are right about the fascination of little wooded islands... I've got Sionascaig and the Loch Maree islands high on my list. You're lucky to be in location up in the far NW! Have you ever taken the Yak in to open water like you would with your Incept? I'd be very interested to hear from anyone with some experience of crossing the sea lochs... for example across loch nevis to knoydart, across the peninsula and then across loch hourn. As McNik says, built for Western Scotland! Nik where are you going on your trip? Thanks Nik and Dave. Just back from Suilven again. What an amazing mountain. We cycled in, climbed up one side, down the other, then paddled Loch Fion 2 miles into River Kirkaig for the footpath back to the car. 2-up 160kg in a 3-kilo boat - not bad! I've splashed about in the sea but I'm quite scared of open water alone. I worry that I'd run out of puff if I misjudged the wind or current or swell or fish turbulence before I got to the other side (though I used to think like that with IKs). As it is tonight (calm enough for the first midges) I'm sure even I could make it the half mile to the island opposite. I suppose it's all in the mind but I'd feel much safer not alone and I'd like a GPS to tell me I'm actually making progress. I hear that Nevis is quite open to the swells at the mouth. I read once of some canoers having come up Morar (freshwater) trying to paddle back from Stoul to Mallaig (sea) and getting in trouble. But as you know you can hug the coast inland to the short crossing and on slack tide hop across. There's also a bothy at the back of Nevis, you could scoot in and out with the tide. And if you've got a skirt you can't really fill up and I can't imagine capsizing. One thing that surprised me last week was how fast the Yak is: 3mph on the flat, 2.7 hacking into a stiff breeze. So I guess half an hour for the mile across Nevis? All depends on currents. There is an occasional ferry as you may know if you arrive on a bad day. Nik, you're link was just a blank page but I've got the idea. Another brilliant route. It's so easy to look at a map up here and string together a few likely lochs, rivers, roads and tracks, with a resupply never more than 3 days away. I take it you're popping into to Oban bothy? I left you a nearly-empty bottle of extra strong soy sauce from last year. You know Morar is the deepest loch in Scotland - quite spooky. When you get back to Morar village, have a look at the beach. The loch spills out in a beautiful curve across the white sands, with Rum and Eigg out to sea (you'll see postcards). At low tide it would be great fun to chute down that in a packraft, just for fun. Looking forward to hearing how you get on. It seems the gales of May are over. Winds have hit 70 this evening but a couple of days ago I did another trip to Suilven; circumnavigating the mountain out along the southern lochs and back along the northside path. There are a couple of nice lochs on that stage too, but it was too windy by then so just three paddle stages over 23 miles - a long day.